Each year, the international FEBS Congress is hosted by one of the many learned societies that make up FEBS. For 2019, it's the turn of the Polish Biochemical Society (PTBioch), with the magical city of Krakow as the backdrop to the scientific discussion. Here, Prof. Andrzej Legocki, Chair of the Organizing Committee, tells us what's special about the location and program. Explore the Congress website for all the details, including the upcoming deadlines. Why Krakow for the 2019 FEBS Congress? The 44th FEBS Congress will be the third edition of this event to be held in Poland, but the first one organized in the southern part of the country – the previous two Congresses, in 1966 and 2004, took place in Warsaw. Krakow, situated just 100 km north of the Tatra Mountains, is Poland’s second largest city, which is also conveniently connected with all European cities through its airport, railway network and highway system. Krakow is a special place for Poland – a magnificent, vibrant city and a part of the great European heritage. It was founded in the 7th century by the mythical ruler Krakus and is situated on the Vistula river. Between the 11th and the 17th century, Krakow was the capital of the Kingdom of Poland. Hence, the famous royal castle erected at the Wawel hill became the place of coronation and a burial site for Polish kings. It was here that one of Europe’s oldest universities – today’s Jagiellonian University – was established in 1364. For centuries, Krakow has been a centre of progressive ideas and cultural movements, and home to many outstanding humanists, writers and architects. It is worth mentioning that several buildings and monuments found in the city are UNESCO World Heritage Sites. Krakow at a glance: ● The former capital of Poland (11th to 17th century) ● Home to the oldest university in Poland (established in the 14th century) ● Krakow's Market Square is the largest medieval commercial square in Europe ● Wawel Castle is one of Europe's finest examples of Renaissance architecture ● In 1978, UNESCO placed Krakow's Old Town on the first list of World Heritage Sites ● Krakow is the city with the largest number of students in Poland (more than 200,000 students). Krakow environs: ● Wieliczka Salt Mine (15 km outside the city) founded in the 13th century ● Auschwitz State Museum of Nazi Concentration Camp (60 km) ● Ojcow National Park – home to Jurassic limestone from 150 million years ago (15 km) ● Tatra National Park – one of the most spectacular examples of an Alpine mountain range, with high peaks, glacial lakes and many more regional attractions (100 km). Which historical attractions in Krakow and in its vicinity are most recommended for visitors? Fortunately, Krakow was spared during WWII, which is why many impressive historic sites can still be admired across the city. Let’s just mention a few of them: the Wawel Castle and Cathedral – the crown jewel among Krakow’s treasures with great monuments and beautiful architecture encompassing the royal residence and necropolis; the vast medieval Market Square (Rynek Glowny), featuring the magnificent 14th century St Mary’s Basilica (with wooden altarpiece carved by Veit Stoss), the Cloth Hall (Sukiennice) and the Town Hall Tower; the National Museum with Leonardo da Vinci’s masterpiece Lady with an Ermine; historic Kanonicza street, with the Erazm Ciolek Palace housing a unique collection of gothic sculptures; and Kazimierz – the medieval Jewish quarter with a plethora of traditional restaurants and local attractions. To encourage Congress participants to explore our wonderful city and thus enrich their overall experience, we are planning to offer guided city tours as well as trips to the most important sites surrounding Krakow (see image caption above), which can be booked in advance. In addition, in view of the special role of Krakow as the cultural capital of Poland – ‘Mecca’ of Polish and international scientists and artists alike – the Congress will offer a unique ‘Art & Science’ session in the early evenings. Let’s now talk about the Congress. How will the programme reflect current trends in life sciences? The programme of the 44th FEBS Congress has been developed in collaboration with the International Scientific Committee and all topics and speaker choices have been carefully selected. The general topic of the Congress – ‘From molecules to living systems’ – has been formulated broadly. This gave us a chance to review the state-of-the-art and the current trends in biochemistry and related fields. The programme has been arranged in such a way that all the dynamic fields like systems biology, synthetic biology or regenerative biomedicine are aptly represented. Five parallel sections will encompass 40 sessions (see the programme webpage here). Posters are also invited for presentation under the same themes. In addition, a concurrent exhibition of specialized companies is planned. It is often said that the list of plenary speakers is the best recommendation for every scientific event. Would you agree? Yes, I fully agree. This is why the list of plenary speakers for the Congress in Krakow is very impressive indeed. There are nine plenary lectures lined up by truly eminent scientists (see website screenshot). 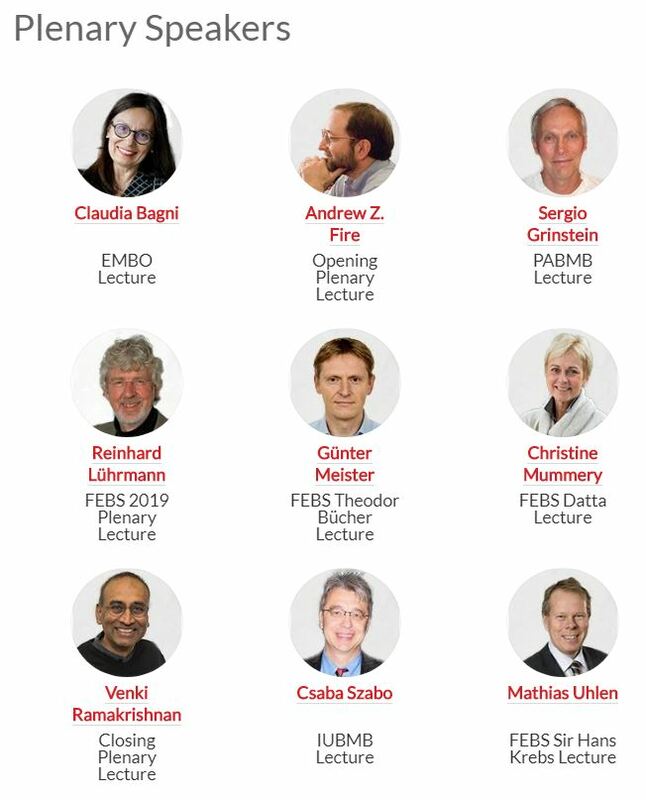 Many of them have been or will be awarded annual medals or prizes of FEBS and other relevant scientific organizations; indeed, two additional lecturers are expected to join this list following selection of prizewinners in early 2019. Furthermore, two Nobel Prize Laureates have confirmed their participation in the Congress: the opening and closing lectures will be delivered by Andrew Z. Fire from Stanford University, USA, and Venkatraman Ramakrishnan from Cambridge, UK, respectively. What is your view on large versus small scientific meetings? Present-day science definitely needs both kinds of scientific events: big meetings reviewing important topics, often deriving from different fields of knowledge, as well as smaller-scale, specialized conferences. Nowadays, holistic concepts strongly affect present trends in life sciences, requiring scientists to monitor analogous or similar metabolic pathways that occur in various biological models. Only then can one postulate more general or universal conclusions. FEBS Congresses provide a large number of researchers with unique opportunities to make these kinds of stimulating comparisons, well-grounded in the first-class science. If well organized, scientific congresses can provide participants with fruitful interactions and memorable experiences broadening their scientific horizons. What kind of advantages may participation in the FEBS Congress offer early-career researchers? Participation in a FEBS Congresses offers several benefits for young scientists. It provides a rare opportunity to be inspired by talks from leading researchers from a range of research areas and to meet them in person, as well as representatives of other important attending scientific organizations such as the ERC. The Congress is also a special chance for young researchers to present the results of their work as a poster or even as an oral presentation during one of the symposia to a wide international audience. Moreover, during the Congress there are additional special sessions organized by FEBS committees, including on research and career skills or teaching, which early-career researchers usually find interesting and valuable. To help the participation of young researchers in the event, there is a low registration fee set for under 35s. In addition, a number of FEBS bursaries will be available to early-career scientists travelling from outside the host country and presenting their work at the event. Furthermore, participants selected for the 19th FEBS Young Scientists’ Forum (YSF) taking place just before the Congress will also receive financial support to attend the Congress. How will you facilitate interactions at the event? We are giving this important aspect special consideration in our plans for the 44th FEBS Congress. The Welcome Reception, and the Gala Dinner held at the Old Tram Depot, offer opportunities to catch up with old friends or enjoy making new ones, while the afternoon poster sessions with coffee provide the chance to interact and network with each other over particular scientific interests. In addition, we are planning to help participants meet and discuss with the speakers they are interested in by organizing Speaker Corners, and also to support the social interaction of young scientists with small-group evening outings to interesting places in the city. 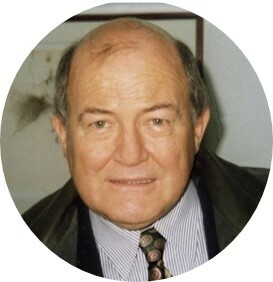 Andrzej B.Legocki represents the Institute of Bioorganic Chemistry, Polish Academy of Sciences in Poznan, Poland. His scientific interest is plant molecular biology. He is a member of EMBO and Academia Europae, and in 2003–2006 he was elected the President of the Polish Academy of Sciences.